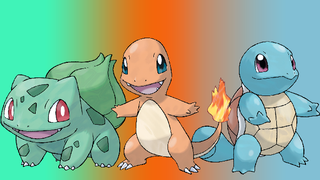 The age-old question for many Pokémon fans has always been: Bulbasaur, Charmander, or Squirtle? Everyone has an opinion on this, and we’ve even used science to answer the question of who the best starter is. Still, the debate is far from settled. For the longest time, I couldn’t help but wonder what the people who actually make Pokémon think about all this. Might they have a different insight on what the best starter is? While interviewing Junichi Masuda, producer of Omega Ruby and Alpha Sapphire, and Shigeru Ohmori, planning director on the remakes, I got a fascinating take on the endless debate. When I asked both men what the best original starter is, Masuda immediately picked Bulbasaur without actually explaining why this was his choice. I pressed him—surely, Masuda must have a reason for picking Bulbasaur? Masuda went on to explain that as Bulbasaur evolves, its Japanese name changes to create a “funny sounding name” that he appreciates. It’s not just the design or name that makes Bulbasaur so perfect for Masuda, though. He has fond memories of helping shape Bulbasaur into the Pokémon we know and love. “I actually created all of the sounds and music in [Red and Blue], and I remember taking one sound and changing the waveforms [for Bulbasaur’s evolution]—taking this cute sound and making it sound cooler. So, it’s just kind of a memorable Pokémon for me,” Masuda reflected. “Of [the starters], its cry sounds the most like a monster to me,” Masuda added. You can definitely hear what Masuda is talking about: while Ivysaur’s cry sounds very similar to Bulbasaur’s, there’s something more menacing about it too. Arguably, Bulbasaur is a smart choice, too—if you pick it in Red & Blue, you have an easier time at the start of the game. Ohmori, meanwhile, had his own opinions. Once Masuda heard what Ohmori’s favorite Pokémon from Ruby and Sapphire was, he couldn’t help but chime in with his favorite from that generation, too. And it explain why Torchic was the first Pokémon out of all the Hoenn starters to get a mega evolution, too. We’re onto you, Masuda! After reading all of this, I’m sure those of you in team Charmander are feeling kind of left out. So here’s to us, the fire reptile lovers—we get to be our very own character in Smash, and more importantly, we’re not rooting for the silly cabbage Pokémon. *Oh god, I’m joking, please don’t be mad.